This tutorial shows you how to delete unwanted tasks in edumate through ‘learning tasks’. 2. 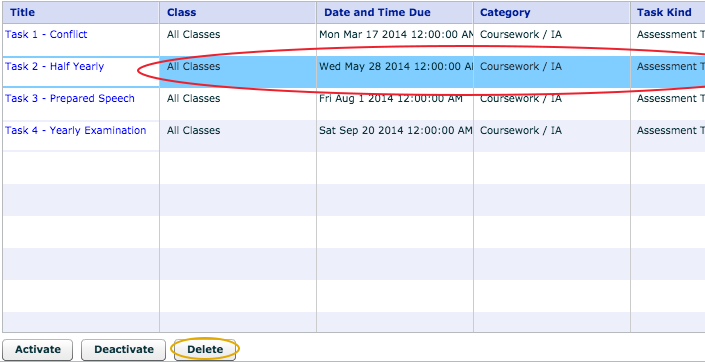 Select the Course you want to remove a task from, and click ‘Get Tasks’ (circled in red below). 3. 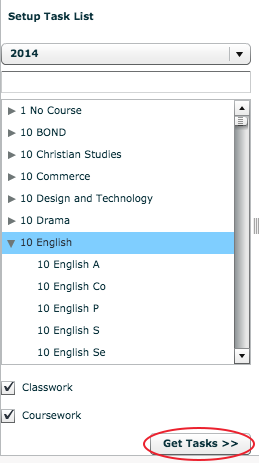 For the task you wish to delete, click anywhere to the right of it’s first column to select it. (If you click the task name you will be taken to the task setup, so clicking to the right of this will just highlight the selected task, an example area you could click in to highlight a task rather than go to it’s setup is shown circled in red below). Click ‘Delete’ (circled in yellow below) to delete the task. N.B. that this cannot be undone.